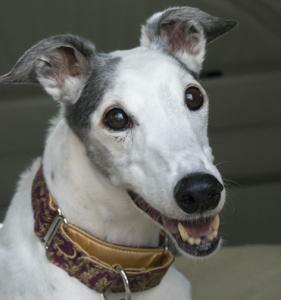 Pixie is a tiny older girl that raced at 56lbs and was a very thin 52lbs when she arrived. She is one of the oldest dogs we have ever taken in and will turn 13 on August 11th. Pixie's family originally adopted her from another group out of the area. They are moving now and are unable to take her with them. She was very fragile and had a constant tremor that made her whole body shake when she was on her feet. Pixie also has a bad limp. We had it x-rayed and it appears to be the result of arthritis in an old injury. Our vet noticed that she was being given 4 times the pain medication she should have been getting. That big of a dose was causing a lot of the trembling and by putting her back on the correct dose a lot of her shaking has gone away and she is able to run and play a little now and is much less fragile in just a couple of weeks. She did have a bad fall down some stairs a few years ago and that was when she started the medication and probably why she limps. Pixie's blood work looked good for a girl her age and she even has good teeth. She is on inexpensive thyroid medicationÂ and her levels are perfect. As of her last vet check she has gained 3 lbs and looks much better than when she arrived. Our vet is very pleased with her progress and has cleared her for adoption. Pixie is a very calm, laid back, girl, that seems friendly and good natured. She lets complete strangers lift her in and out of vehicles and just stood there when the vet drew blood without yelping or flinching. She has lived with cats and small dogs and is good with them. Back in her day Pixie was a star racer and won top A level races and even competed in special stakes races. She raced most of her career at Daytona Beach but also raced a few races in Wichita. Pixie has 130 races to her credit. She was retired to be a brood mom and had one litter of 7 puppies in April of 2006 before becoming a pet. Her sire is Quiet Traveler and her dam is Shoot Fortheloot. This is a super sweet girl that is looking for a family that will love her for the rest of her life. Because Pixie is a senior she qualifies for a reduced adoption fee and some generous donors have offered to help with that.